Soviet tankmen of the 6th Tank Division drive through the streets of Tabriz on their T-26 light tank. The Anglo-Soviet invasion of Iran, also known as the Anglo-Soviet invasion of Persia, was the joint invasion of Iran in 1941 during the Second World War by the British Commonwealth and the Soviet Union. The invasion lasted from 25 August to 17 September 1941 and was codenamed Operation Countenance. 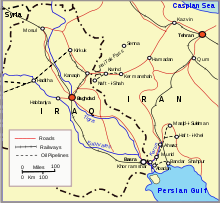 Its purpose was to secure Iranian oil fields and ensure Allied supply lines (see the Persian Corridor) for the USSR, fighting against Axis forces on the Eastern Front. Though Iran was neutral, the Allies considered Reza Shah to be friendly to Germany, deposed him during the subsequent occupation and replaced him with his young son Mohammad Reza Pahlavi. In 1925, after years of civil war, turmoil and foreign intervention, Persia was unified under the rule of Reza Khan, who crowned himself to become Reza Shah that same year. Later, in 1935, he asked foreign delegates to use the term Iran, the historical name of the country, used by its native people, in formal correspondence. He set on an ambitious program of economic, cultural, and military modernisation. Iran, which had been a divided and isolated country under the rule of the Qajar dynasty, was rapidly evolving into a modern industrial state. Reza Shah also made many improvements, such as building infrastructure, expanding cities and transportation networks, and establishing schools. He also set forth on a policy of neutrality, but to help finance and support his ambitious modernisation projects, he needed the help of the West. For many decades, Iran and the German Empire had cultivated ties, partly as a counter to the imperial ambitions of Britain and Russia, and later, the Soviet Union. Trading with Germany appealed to Iran because the Germans did not have a history of imperialism in the region, unlike the British and Russians. The Iranian government did not support the antisemitism of Nazis. Iranian embassies in European capitals occupied by the Germans, rescued over 1,500 Jews and secretly granted them Iranian citizenship, allowing them to move to Iran. The British began to accuse Iran of supporting Nazism and being pro-German. Although Reza Shah declared neutrality at an early stage of World War II, Iran assumed greater strategic importance to the British government, which feared that the Abadan Refinery (of the UK-owned Anglo-Iranian Oil Company) might fall into German hands; producing eight million tons of oil in 1940, the refinery was a crucial part of the Allied war effort. Tensions with Iran had been strained since 1931 when the Shah cancelled the D'Arcy Concession, which gave the Anglo-Iranian Oil Company the exclusive right to sell Iranian oil, with Iran receiving only 10 percent (possibly 16 percent) of the revenue or of the profits. However, the Iranians also began to reduce their trade with the Germans under Allied demands. Reza Shah sought to remain neutral and anger neither side, which was becoming increasingly difficult with the British/Soviet demands on Iran. British forces were already present in sizeable numbers in Iraq as a result of the Anglo-Iraqi War earlier in 1941. Thus, British troops were stationed on the western border of Iran prior to the invasion. The invasion was a surprise attack, described by Allied forces as rapid and conducted with ease. Prior to the invasion, two diplomatic notes were delivered to the Iranian government on 19 July and 17 August, requiring the Iranian government to expel German nationals. The second of the notes was recognised by the prime minister Ali Mansur as a disguised ultimatum. General Archibald Wavell later wrote in his despatch, "it was apparent that the Iranian Government fully expected an early British advance into Khuzistan and that reinforcements, including light and medium tanks, were being sent to Ahvaz". Soviet and Indian soldiers meet in late August. Following the invasion, Sir Reader Bullard and Andrey Andreyevich Smirnov, the British and Soviet ambassadors to Iran, were summoned. The Shah demanded to know why they were invading his country and why they had not declared war. Both answered that it was because of "German residents" in Iran. When the Shah asked if the Allies would stop their attack if he expelled the Germans, the ambassadors did not answer. The Shah sent a telegram to the US President Franklin D. Roosevelt, pleading with him to stop the invasion. As the neutral United States had nothing to do with the attack, Roosevelt was not able to grant the Shah's plea but stated that he believed that the "territorial integrity" of Iran should be respected. The Royal Navy and Royal Australian Navy attacked from the Persian Gulf while other British Commonwealth forces came by land and air from Iraq. The Soviet Union invaded from the north, mostly from Transcaucasia, with the 44th, 47th armies of the Transcaucasian Front (General Dmitry Timofeyevich Kozlov), and 53rd army of the Central Asian Military District, occupying Iran's northern provinces. Air force and naval units also participated in the battle. The Soviets used about 1,000 T-26 tanks for their combat operations. Six days after the invasion and the ensuing Allied occupation of southern Iran, the British divisions previously known as "Iraq Command" (also known as Iraqforce) were renamed "Persia and Iraq Force" (Paiforce), under the command of Lieutenant-General Edward Quinan. Paiforce was made up of the 8th and 10th Indian Infantry divisions, the 2nd Indian Armoured Brigade, 4th British Cavalry Brigade (later renamed 9th Armoured Brigade) and the 21st Indian Infantry Brigade. The invading Allies had 200,000 troops and modern aircraft, tanks, and artillery. Page book of The Regained Glory, a book in the subject of Mohammad Reza Pahlavi. This page is about the Anglo-Soviet invasion of Iran. In response to the invasion, the Iranian Army mobilised nine infantry divisions, some of them motorised; two of the divisions also had tanks. The Iranian army had a standing force of 126,000–200,000 men. While Iran had taken numerous steps through the previous decade to strengthen, standardise and create a modern army, they did not have enough training, armour and air power to fight a multi-front war. Reza Shah's modernisations had not been completed by the time war broke out and the Iranian Army had been more concerned with civilian repression than invasions. The Iranian army was armed with the vz. 24 rifle, a Czech version of the German Mauser. Iran had bought 100 FT-6 and Panzer 38(t) light tanks and additional LaFrance TK-6 armoured cars, enough to outfit their 1st and 2nd divisions. Further Iranian orders had been delayed by World War II. While it was a large order and they were excellent tanks, they were not enough to defeat a multi-front invasion by two great powers. The changing nature of tank warfare in the 1930s made all but 50 of them obsolete when the invasion began. Prior to the attack, the RAF dropped leaflets on Iranian troops, asking them not to fight and to understand their country was "not threatened" as it was being "liberated" from possible Nazi destruction. Soviet and British soldiers rendezvous near Qazvin. The Iranians had little time to organise a defence, as the Allies achieved a tactical surprise. The war began in the early morning hours of 25 August, when RAF aircraft entered Iranian airspace. They bombed targets in the cities of Tehran and Qazvin and various other towns and dropped leaflets urging the Iranians to surrender. The Soviets bombed targets in cities such as Tabriz, Ardabil and Rasht. Civilian and residential areas were hit, and several hundred people were killed and wounded. Reza Shah refused requests by his generals to destroy the road and transportation networks, largely because he did not want to damage the infrastructure that he had painstakingly built during his reign. That contributed to the speedy victory of the Allies. With no allies, Iranian resistance was rapidly overwhelmed and neutralised by Soviet and British tanks and infantry. The British and Soviet forces met at Sanandaj (called Senna by the British) (160 kilometres (100 mi) west of Hamadan) and Qazvin (called Kazvin by the British) (160 kilometres (100 mi) west of Tehran and 320 kilometres (200 mi) north-east of Hamadan) on 30 and 31 August respectively. Faced with massive defeats, the Shah ordered his military to stop fighting and stand down on 29 August, four days into the invasion. The British assembled a naval task force under Commodore Cosmo Graham to seize Bandar Shahpur, Abadan, and Khorramshahr. It attacked at dawn on 25 August. The naval attack began at 04:10 at Abadan when HMS Shoreham opened fire on the Iranian sloop Palang, sinking it in a single salvo. The Abadan Refinery was of vital importance to the British commanders as well as keeping the employees of the Anglo-Iranian Oil Company safe from possible reprisals. Khuzestan Province was defended by 27,000 troops from the 1st, 2nd, 6th and 16th infantry divisions, consisting of both light and mechanised infantry. All Iranian tanks were deployed in Khuzestan as part of the 1st and 2nd divisions. A British naval and paratrooper landing force landed at Abadan securing the city and the refinery. Shoreham remained in the area and provided naval gunfire support. The Iranians managed to put up a resistance and the refinery and the city were captured that afternoon after hand-to-hand combat resulted in the deaths of several British and Indian troops. The Australian armed merchant cruiser HMAS Kanimbla and her escorts successfully navigated the Khor Musa inlet, arriving at Bandar Shapur at 04:15. The Kanimbla successfully landed two battalions of its troops, facing no resistance from Iranian patrol boats. Seven Axis merchant vessels were seized, while an eighth was scuttled. The naval base there was secured that evening following heavy fighting. At Khorramshahr, HMAS Yarra surprised the Iranian sloop Babr, sinking it at its dock. There had been no time to prepare resistance, as the Iranians had been taken by surprise and the head of the navy, Gholamali Bayandor, was killed. The surprise led to virtually no resistance in other areas of Khuzestan. The RAF attacked airbases and communications and rapidly gained air superiority. They destroyed numerous Iranian aircraft on the ground, and protected their forces from Iranian counter-attacks. The 8th Indian Division (18th Brigade plus the 25th Brigade under command from the 10th Indian Division) advanced from Basra towards Qasr Sheikh (which was taken on 25 August) across the Shatt-al-Arab waterway and captured the city of Khorramshahr, which was next to Abadan on the same day. The Karun River was not secured, as Iranian snipers remained, impeding British advance for a short time. Britain also landed troops at Bandar Abbas and the Shatt-al-Arab was secured. By 26 August, there was no organised resistance remaining in the area, with the Iranian forces overwhelmed by superior firepower, 350 Iranians taken prisoner and many killed or scattered. The British hoped to capture Ahvaz and then drive north into Zagros Mountains passes to reach Qazvin, where they would link up with British troops in central Iran and Soviet troops from the north. By the early morning of 27 August, the British forces had reached Ahvaz. The Iranians led by General Mohammad Shahbakhti, had prepared a strong defence. Iranian infantry had entrenched themselves around the city, with artillery support and tanks. Although Iranians had taken heavy losses and their morale was decreasing, they were prepared to fight hard. The Indian Army advance came to a halt and they were hesitant to cross the Karun River and attack the city. A British attack on the defences around the city were repelled by Iranian tanks and infantry. Whether the Iranian defence could have been successful is debatable and on 29 August, after some more sporadic fighting, word reached the Iranian commanders at Ahvaz that their government had accepted a ceasefire and they were not to fight any longer. The British and Iranians agreed as part of the ceasefire that the Iranians would not lay down their arms and remain at their posts but they would be joined by the British troops, who would carry out a parade in the city. In exchange, the Iranians would safely evacuate British residents in the city to British troops. The British with their Indian troops paraded in the city, with full military honours given by the Iranian general. Farther north, the 10th Indian Infantry Division under Major-General William Slim attacked central Iran. Slim directed the battle remotely via radio from India. The Indian Army infantry and armour massed at the Iraqi border town of Khanaqin (160 kilometres (100 mi) north-east of Baghdad and 480 kilometres (300 mi) from Basra). Unlike the terrain in Khuzestan, the British were attacking in Kermanshah Province, with mountainous terrain, advancing along steep mountain passes and a narrow road. The British force broke through the border at the town of Qasr-e Shirin and moved into the Naft-e Shah oilfield with little opposition. The British stated that the operation had been carried out with minimum losses for the Iranians but British troops faced a determined defence by 2,000 Iranians as they tried to capture the town of Gilan-e Gharb 30 kilometres (20 mi) inside of Iran, which if successful would block the British from moving through the steep Pai Tak mountain pass. The RAF provided close air support and was involved in several dogfights with Iranian aircraft. Six Iranian fighters were shot down and several others damaged, for no loss, ensuring air superiority. The RAF also bombed several local towns and dropped leaflets urging surrender. The British captured Gilan-e-Gharb and attacked Iranian forces who defended the town of Sarpol-e-Zahab. With overwhelming firepower and decreasing Iranian morale, the British captured that town, scattering the remaining defenders. The Pai Tak Pass, and the road to Kermanshah and eventually Tehran was open. The armoured columns began to secure the pass and the areas around it. The British forces moved along the Kermanshah highway towards the city of Shahabad. There was little Iranian resistance but some trees were cut down and a section of the road was even dynamited, which delayed the British forces for several hours. The main Iranian forces in the region consisted of the 5th and 12th infantry divisions of 30,000 troops with supporting artillery at Kermanshah and Sanandaj. They were all light infantry (as the mechanised and armour had been stretched thin fighting on multiple fronts). The British reached the outskirts of Shahabad in the early morning hours of 28 August after delays. At the village of Zibri, they faced a strong Iranian garrison willing to put up a fight which caused the British several casualties but with poor Iranian leadership and overwhelming British firepower, resistance crumbled and the British took Shahabad on the morning of the same day. By 29 August, the British had reached the town of Kerend and were within 3 kilometres (2 mi) of Kermanshah and the Iranian commanders were told of the ceasefire order and stood down. The defenders declared Kermanshah an open city and the British entered on 1 September. They also entered Sanandaj peacefully and eventually Qazvin, which had already been captured by the Red Army. The Soviet forces attacked on 25 August and Iranian airbases were destroyed by preliminary air attacks. The Soviets attacked using three armoured spearheads, totalling over 1,000 tanks and motorised infantry; the Iranians had no tanks in the area. The first force, consisting of the 47th Army broke through the border and moved from Soviet Azerbaijan into Iranian Azerbaijan. They moved towards Tabriz and Lake Urmia. They captured the Iranian city of Jolfa. An Iranian reconnaissance aircraft discovered the forces south of Jolfa moving towards Marand. It was possible for the Iranian 3rd Division under General Matboodi to move motorised infantry towards Shibli to halt the breakthrough, but due to being taken by surprise, he failed to make the proper counter-attack. He also failed to destroy the bridges and highways with explosives, allowing the Soviets to rapidly move through the region. Five Iranian bombers were intercepted trying to attack the Soviet positions around Jolfa. The 53rd Army crossed the border and moved towards the city of Ardabil, defended by Iran's 15th Division led by Brigadier-General Qaderi. Two Iranian regiments began to move towards the town of Nir to confront the invaders. Despite having a solid force and well-motivated troops, Qaderi jumped into his car and abandoned his troops. He sabotaged the defence even further by ordering the supply trucks delivering food, weapons and artillery to unload their weapons to make way for his personal belongings. The Soviets bypassed Nir and moved south. Ardabil was bombed by the Soviet Air Force and received minor damage to its barracks. Cut off and bypassed, both the Iranian 15th Division in Ardabil and the 3rd Division in Tabriz began to collapse. Despite that, the regular troops tried to maintain order and began to march towards the enemy without many of their commanders. However, lacking food, supplies and ammunition, the troops were forced to abandon much of their heavy equipment. Heavy pockets of resistance remained, with some desperate fighting until the end. They were unsurprisingly beaten by the Soviets, who 26 August had occupied Iranian Azerbaijan (including Tabriz and Ardabil). On 25 August, the Soviet attack against Gilan Province began with their Caspian Sea Flotilla, led by Rear-Admiral Sedelnikov. The flotilla consisted of more than a dozen patrol boats, destroyers, multiple anti-aircraft barges and landing craft. Facing them were three Iranian gunboats. Meanwhile, the 44th Army crossed the border and moved into Gilan Province. They moved along the Astara highway and the main coastal highway (Jadeh-e-Shomal). Heavy Iranian forces in the area made the naval landing force secure Iranian cities, which were then joined by the land forces. The flotilla landed troops and rapidly captured the border city of Astara. The landing force boarded their ships and moved towards their next targets. The main objective of the attack was to capture Iran's Caspian Sea port of Bandar Pahlavi. The Iranian forces in Gilan, led by General Iranpour, made their stand at the provincial capital of Rasht and Bandar Pahlavi and offered a stubborn resistance. The Iranian forces sank barges at the entrance to Pahlavi harbour, and lacking coastal artillery, moved a battery of 75 mm guns to the area. The Iranians fought desperately, and despite Soviet superiority, the Iranians prevented them from landing. The Iranians were careful to not fire their guns while Soviet aircraft flew overhead to prevent them from disclosing their location. Soviet aircraft were kept at bay by 47 mm anti-aircraft artillery on Iranian barges. The next day, however, the Soviet Air Force moved into action, using many heavy bombers. In groups of 4 aircraft each, their bombers attacked military positions and civilian targets throughout Gilan, including Bandar Pahlavi and Rasht. At least 200 civilians were killed during the bombings. The bombings also destroyed many Iranian positions, and resistance was finally crushed by the 44th Army advancing from land, capturing both cities. Fighting was very intense, and the Soviets took their heaviest casualties of the invasion here. However, lacking armour and air power, the Iranians could not stop the enemy. On 28 August, they were forced to surrender. Nevertheless, some Iranian forces refused to accept defeat, and retreated to Ramsar to continue fighting. Their efforts were undercut when the Iranian government announced a ceasefire the next day. By then, the Soviet forces had reached the city of Chalus, meaning that they could cross the Chalus Highway (Jadeh-e-Chalus) and reach Tehran across the Alborz Mountains. Meanwhile, the Soviet invasion force in Iranian Azerbaijan had moved south. The 47th Army had been delayed in the Jolfa area when three individual Iranian soldiers managed to block an important bridge until they ran out of ammunition and were killed. The Soviets did not use artillery for fear that they would damage the bridge and delay their advance further. The 47th Army moved south, capturing Dilman (100 kilometres (80 mi) west of Tabriz) and then Urmia (Oromiyeh), ostensibly to block the escape of "German agents". The latter was defended by only a few snipers. The Soviets responded by bombing targets in the city, killing over a dozen people and wounding many others, and much of the city's bazaar was burned. Meanwhile, the 53rd Army moved south of Ardebil towards the Tehran-Karaj-Tabriz highway, capturing the city of Mianeh, East Azerbaijan and moving southeast towards Qazvin and Tehran by 27–28 August. Iran's 15th and 3rd divisions had already been bypassed and defeated, and there was only sporadic resistance against the Soviets. The Soviet armoured spearhead drove down the highway and poised to take Qazvin on the 29th (151 kilometres (94 mi) from Tehran), followed by Saveh and Qom, south of Tehran, cutting the main Tehran-Saveh-Persian Gulf highway and cutting Iran effectively in two. But the Iranians accepted the ceasefire on 29 August, and the Soviets entered the now "open city" on 30 August. At the same time, elements of the 53rd Army captured the city of Hamadan. One civilian (a small child) was killed in a small bombing raid, and the sporadic resistance was defeated. They stopped their advance on 1 September and did not move further towards Tehran from Qazvin in light of negotiations with Iran's government. On 25 August, the Soviet Army invaded northeastern Iran from Soviet Turkmenistan. Details of this invasion were not nearly as extensive as details of the others. The Soviet invasion force had to cross mountainous terrain, and its goals were to recruit new troops from the Turkmen Sahra, assemble with the Soviet troops and to capture the city of Mashhad, the second largest city in Iran. Defending Mashhad and Khorasan Province was Iran's 9th Infantry Division, totalling 8,000 troops. They were light infantry, and it was unlikely that they could defend against the more numerous Soviet forces with armour and air power. The Soviet Air Force bombed Mashhad Airport, destroying many Iranian fighter aircraft, along with numerous military barracks. The Soviet forces advanced in three columns across the border. There was heavy fighting for three days, and by 28 August, the Iranians had been driven back after taking heavy casualties. Mashhad fell to the Soviets the same day. British and Soviet officers inspect troops, in preparations to the Joint Soviet-British military parade in Tehran. Iran, September 1941. By 28–29 August, the Iranian military situation was in complete chaos. The Allies had complete control over the skies of Iran, and large sections of the country were in their hands. Major Iranian cities (such as Tehran) were suffering repeated air raids. In Tehran itself, the casualties had been light, but the Soviet Air Force dropped leaflets over city, warning the population of an upcoming massive bombing raid and urging them to surrender before they suffered imminent destruction. Tehran's water and food supply had faced shortages, and soldiers fled in fear of the Soviets killing them upon capture. Faced with total collapse, the royal family (except the Shah and the Crown Prince) fled to Isfahan. The collapse of the army that Reza Shah had spent so much time and effort creating was humiliating. Many of the military generals had behaved incompetently or secretly sympathised with the British and ended up sabotaging the Iranian resistance. The army generals met in secret to discuss surrender options. When the Shah learned of the generals' actions, he beat the head of the armed forces General Ahmad Nakhjavan with a cane and physically stripped him of his rank. He was nearly shot by the Shah on the spot, but at the insistence of the Crown Prince, he was sent to prison instead. The Shah ordered the resignation of the pro-British Prime Minister Ali Mansur, whom he blamed for demoralising the military. He was replaced with Mohammad Ali Foroughi, a former prime minister. The Shah ordered the Iranian military to end resistance and order a ceasefire. He entered into negotiations with the British and Soviets. Foroughi was an enemy of Reza Shah (he was forced into retirement in earlier years for political reasons, and his son was executed by firing squad). When he entered into negotiations with the British, instead of negotiating a favourable settlement, Foroughi implied that both he and the Iranian people wanted to be "liberated" from the Shah's rule. The British and Foroughi agreed that for the Allies to withdraw from Iran, the Iranians would have to assure that the German minister and his staff should leave Tehran; the German, Italian, Hungarian and Romanian legations should close and all remaining German nationals (including all families) to be handed over to the British and Soviet authorities. The last order would mean almost certain imprisonment or, in the case of those handed to the Soviets, possible death. Reza Shah delayed on the last demand. Instead, he planned the secret evacuation of all German nationals from Iran. By 18 September, most of the German nationals had escaped via the Turkish border. In response to the Shah's defiance, the Red Army on 16 September moved to occupy Tehran. Fearing execution by the communists, many people (especially the wealthy) fled the city. Reza Shah, in a letter handwritten by Foroughi, announced his abdication, as the Soviets entered the city on 17 September. The British wanted to restore the Qajar Dynasty to power because they had served British interests well prior to Reza Shah's reign. However, the heir to the throne, Hamid Hassan Mirza, was a British citizen who spoke no Persian. Instead (with the help of Foroughi), Crown Prince Mohammad Reza Pahlavi took the oath to become the Shah of Iran. Reza Shah was arrested before he was able to leave Tehran, and he was placed into British custody. He was sent to exile as a British prisoner in South Africa, where he died in 1944. The Allies withdrew from Tehran on 17 October and Iran was partitioned between Britain and the Soviet Union for the duration of the war, with the Soviets stationed in northern Iran and the British south of Hamadan and Qazvin. The Persian Corridor became the route for a massive flow of supplies (over 5 million tons of matériel) to the Soviet Union and also the British in the Middle East. At the end of August 1942, German intelligence agents spread leaflets in Tabriz and other cities; an underground fascist organisation called Melnune Iran, was founded. Agents of Melnune Iran instigated anti-government protests in the lake Urmia region. The Bakhtiari and Qashqai peoples carried out armed resistance against the new government. The new Shah signed a Tripartite Treat Alliance with Britain and the Soviet Union on 29 January 1942, to aid in the allied war effort in a non-military way. This treaty committed the Allies to leaving Iran "not more than six months after the cessation of hostilities". In September 1943, Iran declared war on Germany, which qualified it for membership in the United Nations (UN). At the Tehran Conference in November of that year, Roosevelt, Winston Churchill and Joseph Stalin reaffirmed their commitment to Iranian independence and territorial integrity, with a willingness to extend economic assistance to Iran. The treaty ruled that Iran was not considered to be "occupied" by the Allies, but instead a member of the Allies. The effects of the war were very disruptive for Iran. Much of the state bureaucracy had been damaged by the invasion and food and other essential items were scarce. The Soviets appropriated most of the harvest in northern Iran, leading to food shortages for the general public. The British and Soviet occupiers used the delivery of grain as a bargaining chip and the food crisis was exacerbated because foreign troops needed to eat and use the transport network to move military equipment. The British meanwhile pressured the Shah to appoint Ahmad Qavam to be the prime minister, who proceeded to mismanage the entire food supply and economy. In 1942, bread riots took place in Tehran, Martial law was declared and several rioters were killed by the police. inflation increased by 450 percent, imposing great hardship on the lower and middle classes. In some areas there were famine deaths but there was virtually no armed resistance against the occupation. In 1943, 30,000 Americans helped to man the Persian Corridor and 26–34 percent of the supplies sent to the Soviet Union under the Lend-Lease Act were sent through Iran. The Americans also assuaged Iranian fears of colonisation by the two powers by confirming that they would respect the independence of Iran. The US also extended Lend-Lease assistance to Iran and began to train the Iranian army. Arthur Millspaugh became the finance minister of Iran but ran into much opposition trying to direct Iranian finances. There were two notable German attempts to undertake operations against the Allies in 1943. In the middle of 1943, Abwehr's Operation Francois was an attempt to use the dissident Qashqai people in Iran to sabotage British and American supplies bound for the Soviet Union. Also in 1943, Operation Long Jump was an unsuccessful German plot to assassinate the "Big Three" Allied leaders (Stalin, Churchill and Roosevelt) at the Tehran Conference. During the three years of occupation, Joseph Stalin had expanded Soviet political influence in Azerbaijan and Iranian Kurdistan in northwestern Iran, as well as in Iran founding the communist Tudeh Party of Iran. The Soviets had attempted during their occupation to stir tensions between the tenant-farmers and the landlords (known in Iran as arbabs). On 12 December 1945, after weeks of violent clashes a Soviet-backed separatist People's Republic of Azerbaijan was founded. The Kurdish People's Republic was also established in late 1945. Iranian government troops sent to reestablish control were blocked by Red Army units. When the deadline for withdrawal arrived on 2 March 1946, six months after the end of the war, the British began to withdraw, but Moscow refused, citing "threats to Soviet security". 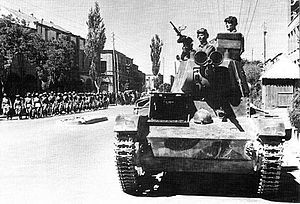 Soviet troops did not withdraw from Iran proper until May 1946, following Iran's official complaint to the newly formed United Nations Security Council, which became the first complaint filed by a country in the UN's history, and a test for the UN's effectiveness in resolving global issues in the aftermath of the war. However, the UN Security Council took no direct steps to pressure the Soviets to withdraw. ^ a b c d e f g h i j k l m n o p q r s t u v w x y z aa ab ac ad ae af ag ah Farrokh, Kaveh (20 December 2011). Iran at War: 1500–1988. ISBN 978-1-78096-221-4. ^ a b c d e f g h i j k Pollack, Kenneth (2 November 2004). The Persian Puzzle: Deciphering the Twenty-Five Year Conflict. ISBN 978-1-58836-434-0. ^ Reed, Stanley; Fitzgerald, Alison (2010). In Too Deep: BP and the Drilling Race That Took it Down. Wiley. ISBN 978-0-470-95090-6. ^ Yergin, The Prize: The Epic Quest for Oil, Money & Power. Free Press, 2008, p.121. ^ a b Beaumont, Joan (January 1981). "Great Britain and the Rights of Neutral Countries: The Case of Iran, 1941". Journal of Contemporary History. 16 (1): 213–228. JSTOR 260624. ^ "Abbas Milani, Iran, Jews and the Holocaust: An answer to Mr. Black". iranian.com. Retrieved 22 September 2011. ^ a b c "Iranian History (1941)". Retrieved 15 September 2014. ^ a b Stewart, Richard Anthony (1988). Sunrise at Abadan: The British and Soviet invasion of Iran, 1941. New York: Praeger. ISBN 978-0-275-92793-6. ^ Encyclopædia Iranica "Anglo-Iranian Relations iii. Pahlavi period"
^ Stewart, Richard A. (1988). Sunrise at Abadan: The British and Soviet Invasion of Iran, 1941. New York: Praeger. p. 85. ISBN 978-0-275-92793-6. ^ "No. 37685". The London Gazette (Supplement). 13 August 1946. pp. 4097–4098. ^ "No. 37685". The London Gazette (Supplement). 13 August 1946. p. 4098. ^ Ward, Steven R. (2009). Immortal: A Military History of Iran and Its Armed Forces. Georgetown University Press. p. 154. ISBN 978-1-58901-258-5. ^ a b c d e f g h i j k l m n o p q r s t u v w x Gholi-Majid, Mohammad. August 1941: The Anglo Russian Occupation and Change of Shahs. ^ Kaveh Farrokh, Iran at War: 1500–1988, Osprey Hardcover, released 24 May 2011; ISBN 978-1-84603-491-6. ^ Parsa, Ali. "Brno, the Persian Mauser". Retrieved 30 August 2015. ^ Barret, Dave. "Iranian Tanks". Archived from the original on 4 October 2012. ^ a b "Armour in Iran Army". Archived from the original on 22 February 2013. Retrieved 15 September 2014. ^ a b c d O'Hara, Vincent P. (30 November 2011). Tucker, Spencer (ed.). World War II at Sea: An Encyclopedia. 1 (illustrated, reprint ed.). ABC-CLIO. pp. 86–87. ISBN 978-1-59884-457-3. ^ a b c d e Stone, Stone &. "War Diary Records for Invasion of Iran 1941". ^ a b c d e f g h i Milani, Abbas (4 January 2011). The Shah. ISBN 978-1-4039-7193-7. ^ Гречко/Grechko 1976, p. 224. ^ "Abadan Airfield Photo". Archived from the original on 28 September 2014. Retrieved 15 September 2014. ^ "Iran in world War II". Archived from the original on 16 October 2009. Retrieved 12 January 2010. ^ "UN History". Retrieved 15 September 2014. Esposito, John (1998). Islam and Politics (4th ed.). Syracuse University Press. ISBN 978-0-8156-2774-6. Гречко/Grechko, А. А. (1976). Годы Войны/Gody voiny, 1941–1943 [The War Years, 1941–1943] (in Russian). Moskva: Voenizdat. OCLC 14013882. Mackenzie, Compton (1951). Eastern Epic: September 1939 – March 1943, Defence. I. London: Chatto & Windus. OCLC 53462081. Kozhanov, Nikolay A. "The Pretexts and Reasons for the Allied Invasion of Iran in 1941." Iranian Studies 45#4 (2012): 479–497. Pollack, Kenneth (2004). The Persian Puzzle: The Conflict between Iran and America. New York: Random House. ISBN 978-1-4000-6315-4. Stewart, Richard A. Sunrise at Abadan: the British and Soviet invasion of Iran, 1941 (Praeger Publishers, 1988), A standard scholarly history. Wavell, Archibald (1942). Despatch on Operations in Iraq, East Syria, and Iran From 10th April, 1941 to 12th January 1942 (PDF). London: HMSO. as published in "No. 37685". The London Gazette (Supplement). 13 August 1946. pp. 4093–4101. "Despatch on Operations in Iraq, East Syria, and Iran From 10th April, 1941, to 12th January 1942" (PDF). Supplement to the London Gazette, Number 37685. 13 August 1946. Retrieved 26 September 2009. "No. 37703". The London Gazette (Supplement). 27 August 1946. pp. 4333–4340. General Sir H. Maitland Wilson's official despatch on the Persia and Iraq Command covering the period 21 August 1942 to 17 February 1943, after the invasion had been completed. 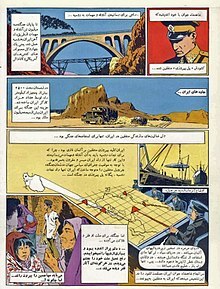 This page is based on the Wikipedia article Anglo-Soviet invasion of Iran; it is used under the Creative Commons Attribution-ShareAlike 3.0 Unported License (CC-BY-SA). You may redistribute it, verbatim or modified, providing that you comply with the terms of the CC-BY-SA.